Bioluminescence imaging (BLI) is frequently cited for its ease of quantification. This fundamental strength of BLI has led to applications in cancer research, cell transplantation, and monitoring of infectious disease in which bioluminescence intensity is correlated with other metrics. 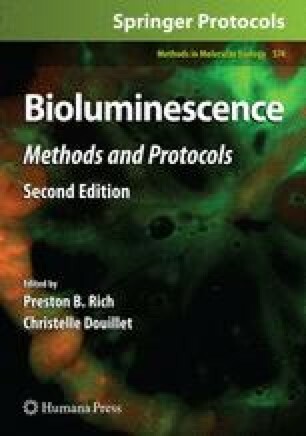 However, bioluminescence measurements can be influenced by a number of factors, among them source location, tissue optical properties, and substrate availability and pharmacokinetics. Accounting for these many factors is crucial for accurate BLI quantification. A number of methods can be employed to ensure correct interpretation of BLI results and validate BLI techniques. This chapter summarizes the use of calibrated light-emitting standards, bioluminescence tomography, and post-mortem validation of luciferase expression for validating quantitative BLI measurements.